It is stacking up to be quite an interesting summer, with very warm weather and lower than average water flows. Many rivers also have lower than average fish runs. However, not everything is doom and gloom for fly fishers that can get up early or stay late, and some rivers are having excellent runs. There are always advantages for true capitalists. 1. When fishing traditional methods, get up very early. Be at your fishing spot before daylight. Plan to be off the water by 9:00 a.m. OR: If you want to fish after the sun is on the water, plan on nymph fishing with heavy flies, split-shot or fast sinking heads. Wear polarized glasses. Do your scouting after the sun is on the water, but before the raft traffic starts. Plan your next morning by spotting fish when the sunlight gives you the best advantages. 2. Be stealthy. Pretend you are hunting elk with a bow. Move slowly. Dress to blend in. Stay low. Wear Earth tones. Fish off your knees when necessary. Hide behind any cover possible. Keep casting strokes to a minimum. Waving a rod around can spook fish. All fish are more prone to bite if they don't know anyone is around. 3. Fish small gear. Gravel bars will be wide, offering lots of back cast room. 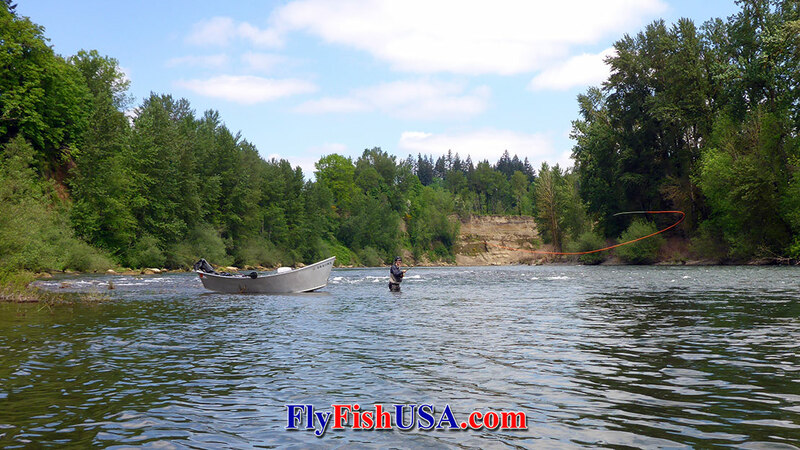 Single-hand, Switch and short Spey rods offer better accuracy than full size Spey rods. They also are stealthier. Four, five, and six weight rods can give advantages. 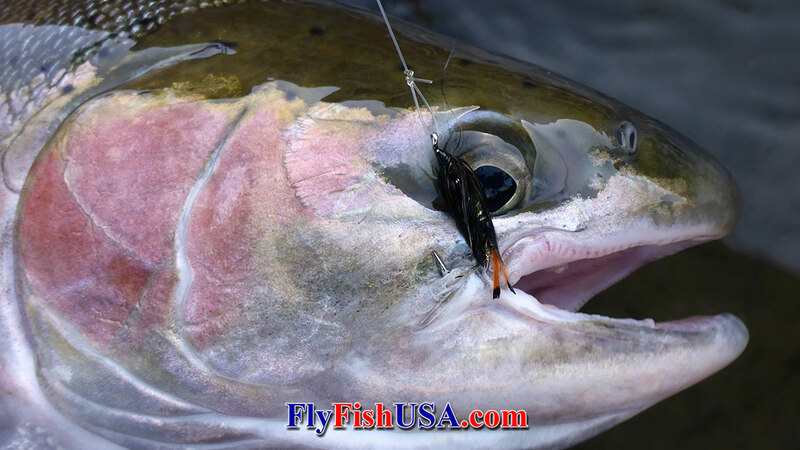 Smaller fly lines are harder for fish to see and create less disturbance on the water. Remember, you are hunting wild animals. 4. Fish fast water. Steelhead are going to be where the highest concentration of oxygen is. Head ends of pools and bubble curtains become holding places for steelhead during warm water periods. If the fish in your river are particularly spooky fish clear, camo lines or long leaders. 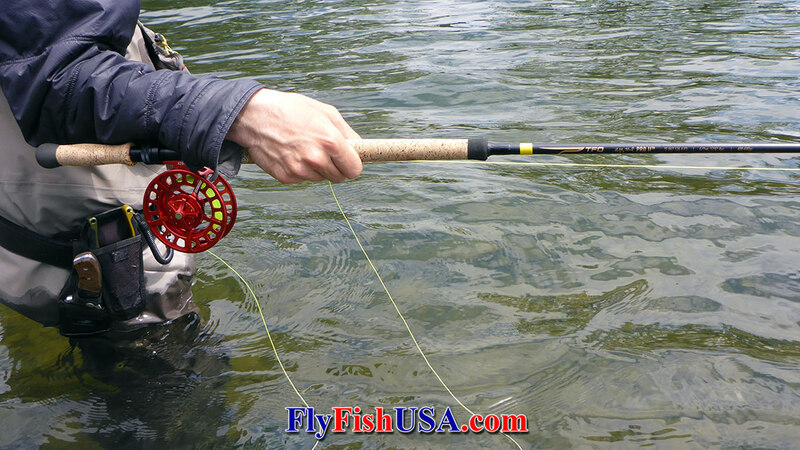 The bright fly line pictured above may be perfect for some rivers, but not for others. Bright lines are more appropriate for darker times of the day, or for larger rivers. 5. Smaller flies can be the answer for clear water. 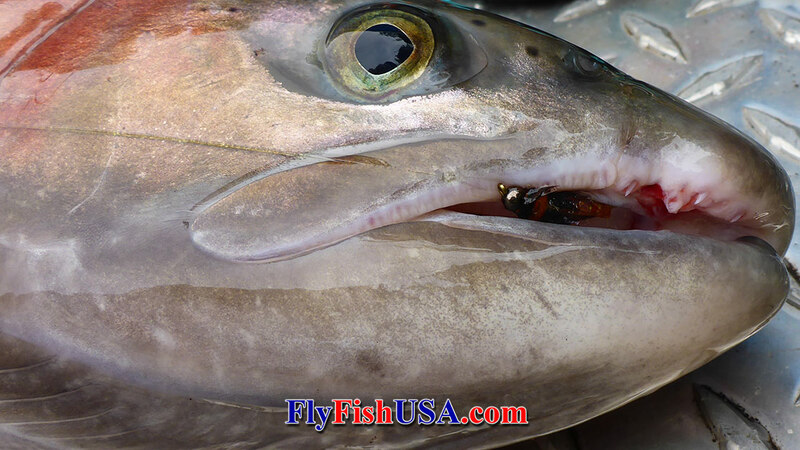 The big (hatchery) buck pictured above came to larger flies several times, but only slapped at them. Then he ate he took a size ten caddis pupa. Persistence is often the key. Little shooters often become big shots if they just keep shooting.